If like us you cooked a large roast for the holidays, you may still have some leftover beef lingering in your fridge. We find that we are more likely to eat leftovers if we incorporate them into different dishes so I thought I'd share some of our favorites lately. This one was dead simple. We layered some of our New Year's Beef, blue cheese leftover from the appetizer cheese tray, some meltier mild cheese like mozzarella or monterey jack & an onion I caramelized earlier in the day onto multigrain bread. Brushed both sides of the bread with olive oil & cooked until hot & melty in our panini pan. If you don't have a panini pan you can heat two heavy frying pans & put one on top of your sandwiches weighed down with cans or even just cook these like a grilled cheese & press down with your spatula. We love how the sweetness of the caramelized onions plays with the sharp blue cheese. This one might be a little more out there for some people. We started out by making Braised Brisket from Constables' Larder (though we did it in the crockpot instead of the oven). We pureed the cooking juices to use as a gravy liked the recipe recommended but then saved what was leftover & reduced it a bit to use as the sauce on this pizza. We made a homemade crust which I seasoned with a little garlic. Topped the crust with a thin coat of the reduced cooking juices. Then we added the shredded brisket. I roasted some baby beets, sliced them & then tossed them on. For cheese we used a very mild blue and a little mozzarella. Then we sprinkled some dried parsley on top (if we had fresh we would have used that). 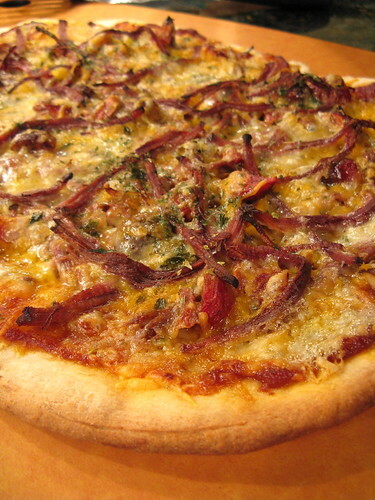 An unusual pizza for sure but one with the flavors of a beef dinner. We still have a little beef left & will mix that into a beef, barley & root vegetable soup later this week. good grief I am now starving. I just ADORE this combo in a sammie and on a pizza. I think I made one of these last year on a pizza. So good. Loving the panini Kat - even better as I can now enjoy blue cheese aain!! Kat this sounds totally delicious to me. I love beet soup and often put beef in it. Add bread and I think, I know, I would love it. I *love* it! Awesome pizza idea. I must make. beets and beef, eh? and on a pizza, no less! that's very crafty, and it sounds very tasty too. bravo. 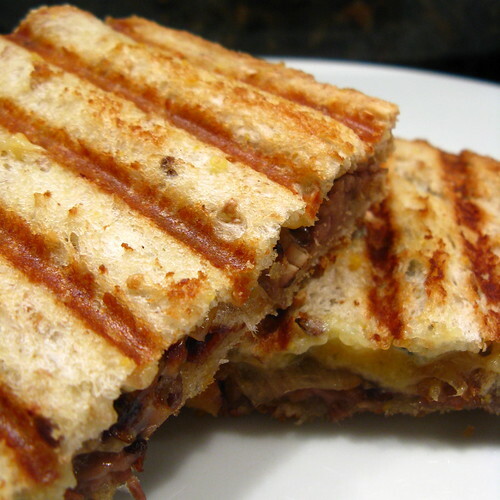 OH I love panini any which way, it's delish. Thought about getting a panini grill but one more small appliance and I'll have to start storing them in the garage! I need to make that roast so I can make these sandwiches! I have to check out your Guinness stew. I had some at an Irish restaurant in Mpls and it was incredible!